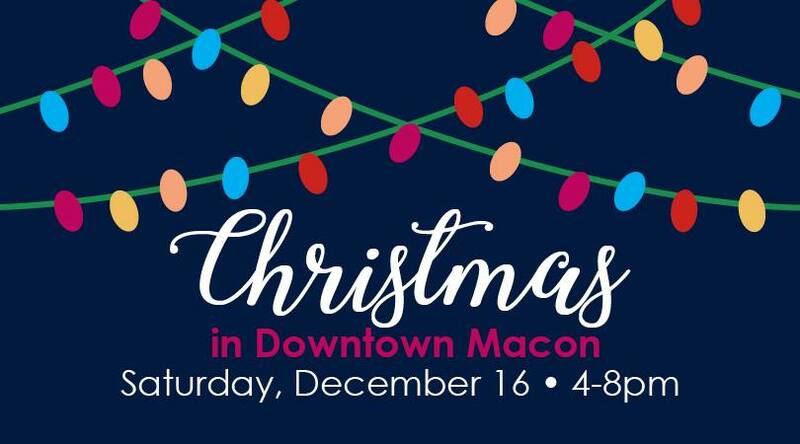 On Saturday, December 16th, Main Street Macon and Just Tap’d will host Christmas in Downtown from 4pm to 8pm. Christmas in Downtown is a holiday festival featuring a Macon Makers Market, snow, free pictures with Santa, festive music, and more. Just Tap’d and Main Street Macon hosted similar events in the past. This year, the event will feature activities throughout downtown in addition to the established traditions on First Street. First Street will be closed to vehicular traffic and be transformed into a Macon Makers Market featuring 30+ vendors. Vendors will also occupy Rosa Parks Square and a stage will feature holiday music from Greg Black of 365 Cotton, sponsored by BlackHAMMOND, Bentley Hudgins, and Chip Holton. Snow will fall from the community Christmas tree. Free pictures with Santa will be available in the basement of Just Tap’d and The 567 Center for Renewal will have hot chocolate and ceramic keepsake ornaments for families to create for only $3. Besides the activities on First Street, the Downtown Macon Community Association (DMCA) will transport visitors on a worldwide tour of winter traditions in various alleyways with support from the Downtown Challenge Fund of the Community Foundation of Central Georgia. “Downtown Macon is such a diverse community of people that celebrate in many different ways. DMCA wants to celebrate with them,” said Scott Mitchell, DMCA president. Downtown businesses will offer sales and other promotions. For example, Ocmulgee Brewpub will have free hot cider and screen a Christmas movie at 8pm. Downtown-goers can also witness the Main Street Christmas Light Show Extravaganza along Poplar Street. Shows occur at 7pm, 8pm, and 9pm. Christmas in Downtown is free and open to the public. For more information, visit mainstreetmaconga.com.